Featuring lightweight, strong plasticity, excellent chemical characteristics and high cost-performance, plastics and rubber are widely used in various applications, thus driving the rapid development of plastics and rubber industries in recent years. As the international community advocates and calls for sustainable development and green economy, the global plastics and rubber industries are moving towards the direction of intelligent manufacturing, green and environmental friendliness, innovation and high efficiency. As the second largest plastics and rubber exhibition in the world, after K show in Germany, Chinaplas is a well-known trade fair with all-round demonstration of innovative achievements from home and abroad. It serves as a great platform for idea inspiration, technological innovation, and business exchange for the plastics and rubber industries. With the release of numerous new technologies, the last edition of Chinaplas was highly appraised by the visitors from all over the world. The show organiser assured that more new technologies will be further unveiled in the coming Chinaplas 2017, which will focus on "Intelligent Manufacturing, High-tech Materials and Green Solutions", with exhibits and solutions covering every stage of the product lifecycle in different sectors, such as E&E and telecom, automotive, packaging, building & construction, medical, etc., fully illustrating CHINAPLAS’s position as a technology and business platform with high-tech content, high value and high standards. Several countries unveiled their industrial development plans pertaining to intelligent manufacturing, such as “Industry 4.0” by Germany, “Industrial Internet” by the US, Japan's “Robot Strategy”, China’s “Made in China 2025”, etc. All of these advocate the acceleration of industrial transformation, with focus on smart intelligent manufacturing. Confronting the problems, such as high labour cost and low production efficiency, most enterprises are in urgent needof highly automated and interconnected factory technology. 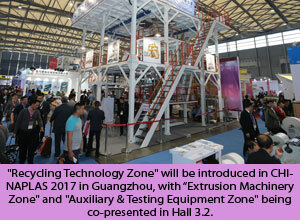 The "Automation Technology Zone" will be set up once again in the coming Guangzhou edition. According to the organiser, the exhibitors’ line-up will be more magnificent in terms of exhibition area than that of Guangzhou edition held in 2015. It is expected that plenty of overseas well-known exhibitors, including ABB, Siemens, Mitsubishi, Bosch Rexroth, Universal Robots, Staubli, Delta Greentech, Lite-On Electronic to name but a few, will present their advanced solutions. In addition, the zone will welcome Taiwan Electrical and Electronic Manufacturers’ Association, which will organise the participation group to Chinaplas for the first time. What’s worth mentioning is that the exhibits are also of novelty. Many collaborative robots will be on display to comply with the trend of man-machine collaboration and artificial intelligence technology. Intelligent factory related solutions will also be brought to the zone. All these will jointly serve the goal of realizing intelligent manufacturing and production automation, promoting output, efficiency and quality, enabling lean production while controlling costs and reducing manpower. 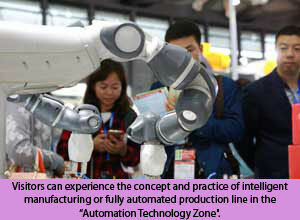 Besides stand-alone machines, the "Automation Technology Zone" will showcase the entire production lines as well. Visitors can experience the concept and practice of intelligent manufacturing or fully automated production line there. Industry 4.0 Conference will be held concurrently, spotlighting the concept and practice of industry 4.0. The advocacy on "low-carbon economy" ushers to brighter prospects for the high-tech materials. With the acceleration of artificial intelligence commercialisation, and the advent of new energy vehicles, unmanned aerial vehicles (UAVs), and virtual reality (VR) technology, coupling with the speedy development of rail transportation and aerospace industries, the requirements set for high-tech plastics, rubber and elastomer will be higher, and enhancement of their performance will become more important. Chinaplas 2017 will bring together the world's top plastics material suppliers in the "Chemicals and Raw Materials Zone", "Composite & High Performance Materials Zone" and "Bioplastics Zone" , which focus on high-end innovative materials featuring high separation, high transparency, boiling resistance, UV resistance, antibacterial, ultra-high strength, avoid spraying and biodegradable. All these high-tech materials can sufficiently meet the diversified demands of the downstream application industries, such as lightweight automobile and electronics, food safety, green packaging, low carbon buildings, etc. Medical plastics are other potential huge markets, with eye-catching performance in recent years. The value-added medical industry remains a double-digit growth every year. Plastics are widely used in medical devices, disposable supplies and pharmaceutical packaging; meanwhile there are strict requirements on medical plastics materials, including laws and regulations compliance, biocompatibility and design flexibility. Facing the market trend, Chinaplas organiser will hold the 3rd Medical Plastics Conference to share the latest technology of medical plastics and explore more innovative applications in the medical industry. Efficient utilisation of resources and green solutions is the only way towards circular economy. Most of the manufacturing enterprises will have to use green materials to lower carbon emission during the manufacturing processes. Lightweight, diversified functionalities, biodegradable and recyclable plastics have become the strategies adopted by many industries for sustainable development. 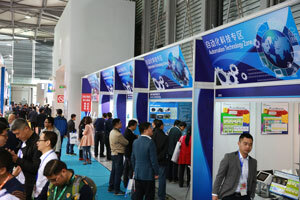 It is reported that the number of exhibitors in "Recycling Technology Zone" will continue to increase, and the following enterprises are expected to participate in: Tomra Sorting, National Recovery Technologies (NRT), Telford Smith, Jiangsu Fangsheng, ZhangjiagangLianguan Recycling, Zhejiang Boretech and Suzhou Zhongsu. The organiser reveals that there are a lot of exhibitors who will be present for the first time in "Recycling Technology Zone". Due to rapid development of plastics processing technology; all downstream sectors show the momentum of strong growth. According to the organizer, quite a few exhibitors will enlarge its booth area to showcase its core and competitive products. Some exhibitors revealed that they will show their complete production line. Exhibitors from several countries are positive to the China and global markets, and they will participate in the show actively. For example, Sodick, Mitsubishi, Matsui, Asano Laboratories, etc. from Japan have already reserved their booths in Chinaplas 2017. In the first edition of Chinaplas held in 1983, there were about 100 exhibitors, with nearly no Chinese exhibitor. After 30 years of development, the proportion of Chinese and overseas exhibitors reached 6:4. Number of Chinese exhibitors has surpassed the overseas exhibitors, and it can be concluded that over the past three decades, China's plastics market has undergone significant and rapid growth. With strengthening innovative ability, the technology level of China machines and quality of chemical raw materials are comparable to international level whereas the product portfolio has been enriched. Besides, Chinese enterprises also actively set up offices abroad in order to better serve overseas customers. Due to its high cost-performance and increasing competitiveness, China-made technologies and raw materials have successfully caught the attention of global market. Chinaplas 2017 will bring leading Chinese enterprises under the same roof, including Shaanxi Beiren, Guangzhou Tech-long, Haitian, Yizumi, Hangzhou Zhongya, Shanghai Zhoutai, Deqing Tide, Newamstar, Wenzhou High Sea, Liuzhou Jingye, Quinko, Suzhou Jwell, CML, Guangzhou Unique, Dalian Sunlight, XinleHuabao, East Zhouqiang, Guangdong Jinming, Guangzhou Lianguan, Yongming, Zhuxin, Hotsys, Wuxi Yang Ming, Nanjing KY, Designer, Kingfa, Bluestar, CPIC, etc. Chinaplas 2017 will return to China Import& Export Fair Complex, Pazhou, Guangzhou, PR China on May 16 to 19, 2017. The show will join hands with over 3,300 exhibitors from 40 countries and regions, welcoming more than 140,000 professional buyers all around the globe.